So, here’s my review of the actual film: IT’S DOPE! Not only do we get a movie replete with beautiful Black folks, we get to see Caribbean actors in starring roles. But beyond the cast, this film is a must-see for my fellow Caribbeans, especially those living abroad. 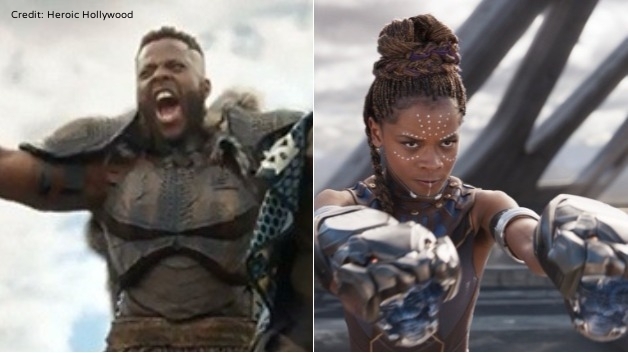 "Black Panther" has many themes, but the one that resonated with me was the idea of "home" and how that impacts the conflict between the two main characters. T’Challa was born in Wakanda and only leaves temporarily before returning to take his place as king and Black Panther. He is ruler and protector, seeing to it that Wakanda is not ravaged for its resources like the rest of Africa. Despite M’Baku's challenge for the throne, T'Challa has the love and respect of his people and everything's pretty much kumbaya. This is not the reality for Erik Killmonger. Although he is a descendant of Wakanda, he has never been there and so he is seen as an outsider. However, it is because he resides abroad that he is able to see how colonialism continues to plague Black people around the world. Killmonger plans to weaponize Wakanda's fictional indestructible metal vibranium to empower Black people. Killmonger returns to Wakanda to challenge T'Challa's power, but even he knows that in order to gain allies, he must come baring gifts. Like us, he has to court his family in order to be welcomed into the fold. Okay, for us it's new clothes and cellphones and for him... well, it's the dead body of murderous thief Klaue. Pot-ay-to, Pot-ah-to. You get my point. As a child, going "back home" meant a trip to Guyana to visit Auntie whomever or attending the wedding of cousin so-and-so. When I got older, I studied the politics, learned the music, and emphasized my accent in an effort to be legitimized. Killmonger, however, proudly maintains his outsiderness throughout the movie. He speaks crassly, he walks intensely, and he maintains a contrary physical appearance. He does not need to be accepted to be Wakandan. Killmonger is an inspiration to those who live the liminal identity. Both of my parents are Guyanese. I grew up listening to their stories, hearing the accents, and eating the damn good food! But my Guyanese-ness gets challenged because I currently reside in Brooklyn, NY. However, being born outside of Guyana does not mean that I am any less entitled to wave the flag of my parents' homeland. Killmonger's return home aides in the country's development. He forces the natives to think beyond their own nation and consider the full diaspora. He challenges the status quo and ultimately influences T'Challa's decision to offer Wakanda's resources to help Africans and their descendants both within and outside of Africa. Returning home is a theme in the region inna real life. President Granger recently called for Guyanese living abroad to come back home and invest in new industries to help the country's economy. The tourism commissioner also called for citizens to return to the U.S. Virgin Islands as half of the population no longer lives in the region. The truth is, we need each other. Caribbean residents need those outside to aide the economy while Caribbeans abroad need a place to call home.